The campaign field office has been cleaned out, the lawn signs have been taken down, and I’ve had a few days to reflect on the extraordinary occurrences of the past week. I suppose when you dive head first into a cause that you believe in with your entire being, the effects of its successes are magnified. The surfeit of joy was matched by the exuberant pride I felt in my country, my countrymen and the democratic process. It was truly an honor to participate in Barack Obama’s presidential campaign and those election night memories will stay with me forever. One thing I was happy to turn the page on was the glut of convience and junk foods that are a hallmark of any campaign, from those ubiquitous boxes of Entenmenn’s doughnuts to the countless hoagies from Wawa. Food was calories in the most basic sense, something to fuel you as you knocked on hundreds of doors. But that part is over for me, thankfully, and I can get back to making food the way I like it. I decided to make these brownies since I received the recipe on a card at Le Pain Quiotidien in Manhattan, where I lunched with my mother and sister-in-law on Friday. There were only 5 ingredients, all of which I had in my pantry. (One exception – I did not have pastry flour, but it can easily be made with a 1 : 2 ratio of all-purpose flour to cake flour). These need to baked in cupcake papers since they are extremely crumbly and will fall apart when cut if you try to bake them in a traditional baking dish. 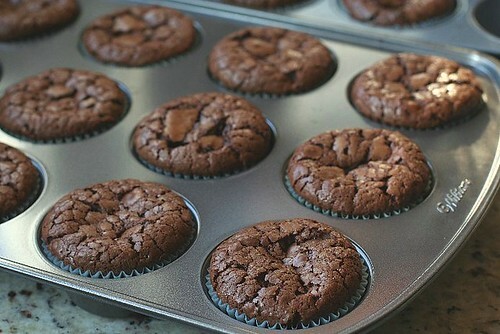 They are rich and chocolaty, yet paradoxically light and airy. 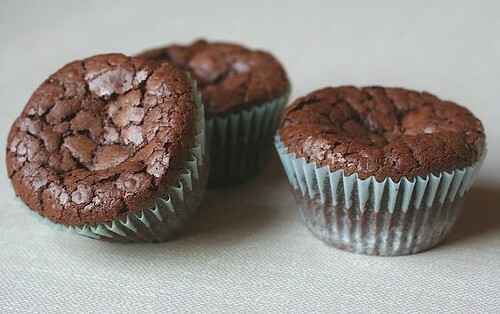 If you love a heavy dense brownie, you might not like these as much. 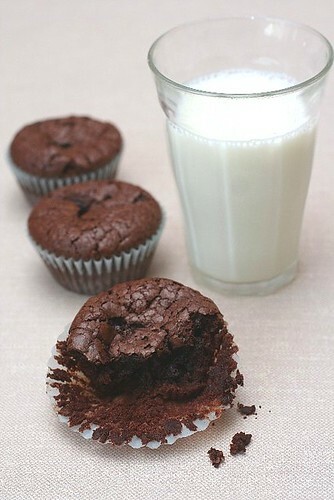 However, if you simply love chocolate, you should give this recipe a try. It has a wonderful crunchy top and is very moist in the middle. We had this with a tall glass of organic milk (classically delicious), but I think it would be amazing warm with a scoop of vanilla bean ice cream. 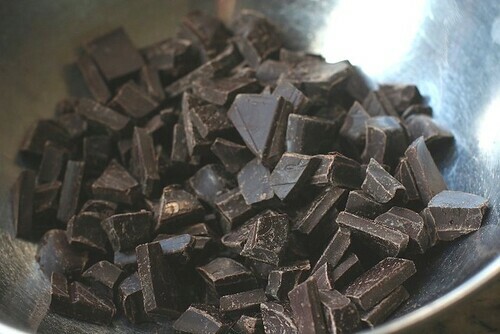 Roughly chop the chocolate into pieces. Transfer to a medium bowl and add the butter. Place bowl over a saucepan of simmering water until the two ingredients have melted. Mix well and transfer to a large bowl and set aside. Preheat the oven to 325º. Sift the sugar and flour together, then stir into the chocolate. Add the eggs and mix well. Cover and let rest at room temperature for 30 minutes. 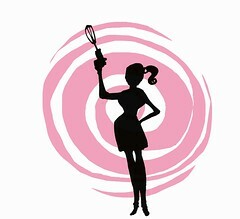 The batter will thicken as it stands. 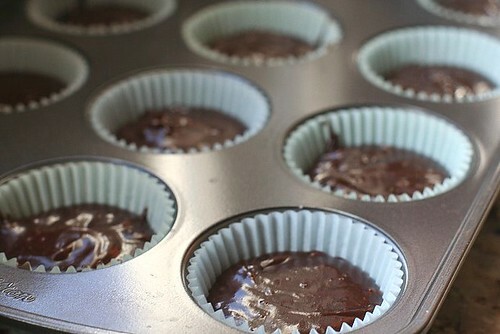 Line a muffin tin with cupcakes papers. Spoon 1/4 C. of the batter into the paper-lined cups. Bake 30 to 35 minutes. The brownies will still be moist when done. They will puff up and fall slightly as they cool. These look devine. Crispy on top and moist in the middle…just the way I like it! That’s so awesome that you were so involved in the campaign! Good for you :D! Wow, these are amazing! Bookmarked! And even more glad of the presidential results!! WHEW!! The shiny crackled tops of these guys is drool inducing. « October Daring Bakers Challenge: Pizza!